Milan is located in the Northern part of Italy. Thanks to its geographical position, Milan offers both national and international easy connections. Airports like Malpensa, Linate and Orio al Serio enable the visitors to easily reach the town and vice versa. Central Station, Cadorna and Porta Garibaldi are the main nodes of the local and international railway networks for those who wish to travel by train. The Metro subway, with its four lines (yellow, red, green and liliac) developing in the foundation of the city, enable reaching any point of interest, and Milan also offers a network of equally efficient urban buses and trams. Railway and Road lines, both national and international, lead out of the city, as well as most of Italian Motorways (for Venice, Bologna – Rome – Naples, Genova and Turin). A protagonist of the economic and commercial life, this city is the concrete expression of a continued will of dynamism and renewal. 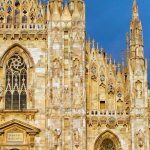 The agenda of Milan offers multiple activities to visitors; a calendar full of cultural, gastronomic and folkloristic events. Performances of all types, from concerts to world-renowned exhibitions like the Salone del Mobile, the Milan Fashion Week, TuttoFood and, shortly, also the important Expo 2015. Many places of historical, artistic and cultural interest to discover in the city, alongside more contemporary places. Here we suggest only a few of these, which you should absolutely see when visiting Milan. The Duomo of Milan, the magnificent cathedral, symbol of Milan and product of ages of work, rises imposing in the homonymous square. The Galleria Vittorio Emanuele II is a pedestrian transit hosting historical shops and greatest names, joining Piazza del Duomo to Piazza della Scala, where the famous alla Scala theatre is located. The Cenacolo Vinciano or “The Last Supper”, one of the most important works by Leonardo Da Vinci, conserved in the former refectory of the monastery adjacent to the Sanctuary of Santa Maria delle Grazie in Milano. Palazzo Reale, beside the Duomo, this building is often a stage for exhibitions and world-renowned trade fairs. The sumptuous Castello Sforzesco, often hosts important exhibitions and fairs among which: the Egyptian Museum, the Prehistory and Protohistory Museum, giving the opportunity to also visit the nearby Parco Sempione. The new area designated as “Porta Nuova”, unveiled in December 2012 and designed by architect César Pelli, represents an example of great urban restoration in Milan. The architectural complex, consisting of 3 eco-friendly buildings in glass and steel arranged in a semi-circle, is the first in Italy to achieve the Leed Gold Certification by US Green Building Council (a reduction of energy consumption by 37% is estimated). Inside rises the vital centre of the new neighbourhood: the highest tower of Italy, with its 321 metres, known as Unicredit Tower or Hines Tower, and Gae Aulenti square, a 100-metre diametre circular square raised 6 metres from street level, allowing you to enjoy an excellent landscape of the new Milan skyline (in the background, you can see the Palace of Lombardia region, the Diamond Tower, the Pirelli skyscraper and all the new buildings of Porta Nuova Project). The Porta Nuova neighbourhood offers new meeting-places in the centre of the city. A few minutes’ walk from the Brera area, from Piazza della Scala and Castello Sforzesco, the new Porta Nuova neighbourhood becomes the natural continuation of the historical centre and develops in the direction of the Expo 2015 area. Porta Nuova imports the best global expertise, combined with the classic tradition of Milan, with high environmental sustainability standards, implementing the greatest pedestrian area integrated in the centre of town. The three historical neighbourhoods of Garibaldi, Varesine and Isola rejoined and enriched with a unique pedestrian plan of more than 160,000 sq.m., with 5 km of cycle routes, multiple urban facilities and a wide public park the “Gardens of Porta Nuova” of 90,000 sq.m and 1,500 new trees. Here will arise the Modam, intended to become a training pole dedicated to creativity, the House of Memory, a museum dedicated to the memory of Resistence of Milan and to the victims of terrorism; The Riccardo Catella Foundation, which promotes and studies the best practice in development of territory, the Incubator of Arts, an experimental place continuing the cultural and artistic experiences consolidated in the Isola neighbourhood, an exposition centre in Garibaldi Area, and a cultural centre in Varesine area. Brera Astronomic Observatory, Botanical garden, Library, Institute of Sciences and Letters, and Academy of Arts in an elegant baroque palace, offers its visitors some charming spots of the ancient Milan. The National Museum of Science and Technology Leonardo Da Vinci, the greatest technical-scientific museum in Italy, represents the product of technological and scientific human intellect of every epoch, featuring the greatest global collection of models of machines realised from Leonardo da Vinci’s drawings. The Museum of Natural History of Milan, , established in 1838 is one of the most important Natural museums in Europe. The “Ulrico Hoepli” Planetarium, unveiled on 20 May 1930, is the second Planetarium built in Italy. Thanks to a projection system, it is possible to observe the aspect of the starry sky and the astronomic phenomena visible from any place of Earth in the past, present and future. The Museo del Novecento, at the Arengario Palace, with approximately four hundreds works of modern art, selected among 4,000 works dedicated to Italian art of 20th century; property of Art Collections of Milan.